The eight installment of the Prospect Previews series takes a look at a reliever vying to be in the major league mix, and an outfielder looking to breakout after a season slowed by injury. Strengths: Jones is a big left-handed reliever with an over-the-top delivery that is deceptive to batters. His two-seam fastball sits 88-91 MPH with some late movement that tails away from right-handed batters and in on left-handed hitters. Although the pitch is not overpowering, it appears faster than it is given the deceptive way Jones releases it, and he can get it by batters up in the strike zone. An aggressive pitcher who goes right after hitters, Jones can pound the zone with his fastball and has good control overall. His slider is more of a slurve pitch, a mix between a curveball he used to throw and a true slider. The pitch comes into the zone 80-82 MPH and while it is not a hard, biting slider, it is effective when it is down in the zone as batters will chase it with two strikes. He’s been effective against right-handed hitters during his minor league career and has been able to pick up a strikeout per inning in AA/AAA. Added to the Red Sox 40-man roster in November of 2008, Jones has worked his way into the mix for a spot in the Boston bullpen in the future after going undrafted in 2005 and signing with the team later that summer. Development Needs: Despite being a lefty, Jones doesn’t have great success against left-handed batters and doesn’t project to be used as a specialist in the future. Some improvement against left-handed batters would help further carve a role for him at the major league level. His slider has been effective, but he doesn’t really throw the pitch for a strike, and relies on his fastball to get ahead of hitters. Catching a little bit of the strike zone with his slider would help keep hitters further off-balance and enhance his deceptiveness, but given the smaller break on the pitch he’ll have to be fine to keep it out of the middle of the plate. Jones will need to continue to demonstrate the good control he has shown in his career thus far, as he has given up about a hit per inning in AA/AAA and is prone to giving up some contact. 2009 Outlook: Jones is in the major league camp and if everything plays out the way the Red Sox expect, he’ll start the season in the bullpen for Pawtucket. Expect Jones to continue his aggressive ways on the mound and go right after AAA hitters once again. He should have good success using his fastball, locating it on corners and sneaking up on hitters up in the zone. Some improvement on the sharpness of his slider would further enhance his effectiveness, and he should be successful ahead in the count and down in the zone. Jones could start mixing his slider in earlier counts, something to take watch of as the 2009 season unfolds. With a strong camp, he could work his way into the mix for a call-up during the season if injuries hit the Red Sox bullpen. 2009 will be an interesting and exciting year for Jones, as a player on the cusp of making it to the big leagues after the unheralded journey as an undrafted free agent in 2005. Strengths: Kalish is an excellent athlete overall. Possessing great speed on the base paths and in the outfield, a solid build and excellent bat speed produced by his strong wrists, he is the total package in terms of tools for a baseball player. A tough player and hard worker, Kalish put in a lot of work with the Red Sox staff in Florida prior to breaking camp in 2007 with Lowell, and the results paid off with a strong start to that season. Whipping the bat head through the zone, Kalish makes hard contact and produces line drives to all parts of the field. He’s become a patient hitter since joining the system and posted a .449 on-base percentage in the Hawaiian Winter League this past winter. On the bases, Kalish is a threat to steal and can make an impact with his wheels. Covering a lot of ground in the outfield, Kalish can play both center and right field well, showing off an above-average arm and the ability to make plays. A very strong player, he has the potential to add power to his game as he learns to drive through his pitches and lift the ball more with his swing. Exciting and very popular, Kalish has the overall package to make an impact in many different ways. Development Needs: A broken hamate bone derailed Kalish’s strong start to 2007 and lingered throughout his 2008 season, stunting his development. Not fully comfortable with his wrist in 2008, Kalish was unable to unleash with his swing like he had in the past, and his bat speed suffered as a result. After starting off slow, he was able to raise his contact rates, but his power lagged behind. Kalish will need to gain more trust in his wrist and get back to aggressively attacking pitches he can drive. He has some lost time to make up for, but as an extremely hard worker Kalish should put the extra time in to round his game back into form. It remains to be seen how his power will end up playing into his game given his setback, but the overall package is there for him to increase his power output. Working on creating more loft in his swing is something that he can focus on given his strength and bat speed. Kalish can gamble in the field from time to time, and needs a little more refinement on his decision making in the outfield. 2009 Outlook: Kalish was one of the first players to report down to Florida this year, and it has been reported that he looks a lot stronger than last year. Look for Kalish to begin in one of the outfield spots with the Salem Red Sox. With the lingering effects of his wrist injury behind him, one of the main things to watch for is how he attacks the baseball at the plate this season. Expect Kalish to put more balls into play via hard contact while continuing to use the whole field. He should exhibit good contact rates as well as increasing his extra base hit totals in 2009. Another area of development to watch for is how his patient approach jives with the advancement of pitching at this level. Kalish has put a lot of work into his understanding of the strike zone, so expect him to continue to pick his pitches out while laying off some of the tougher ones he can’t handle. 2009 should be a year that provides a clearer picture of Kalish now that his wrist troubles are behind him, and one that has many prospect followers intrigued at what he can accomplish on the baseball diamond. The major league spring training squad packed up their bags yesterday and moved from the Player Development Complex down the road to City of Palms Park ... The big league game schedule gets underway today with an afternoon scrimmage against Boston College and a Grapefruit League game against the cross-town rival Twins ... According to Kevin Thomas, several prospects are penciled in to see time on the mound against Boston College, including Clay Buchholz, Kris Johnson, Junichi Tazawa, Felix Doubront and Daniel Bard ... Against Minnesota, look for Justin Masterson, Manny Delcarmen, Javier Lopez, Ramon Ramirez, Billy Traber and Dustin Richardson to follow starter Tim Wakefield ... In the field, likely PawSox Chris Carter, Jon Van Every, Nick Green, and Angel Chavez will start this afternoon (George Kottaras, who is out of options, will start behind the plate) ... In the evening game, Jeff Bailey and Gil Velazquez are scheduled to start ... With the major leaguers gone from the Player Development Complex, minor league mini-camp gets underway this week, including most of the players from the 2008 Fall Instructional League and other players who voluntarily reported early ... In other news, Globe reporter Amalie Benjamin notes that Terry Francona has instructed Lars Anderson to work on his defense and "enjoy the experience" during his time in major league camp this spring ... Benjamin also talked to Josh Reddick, who was overwhelmed and excited by his first major league camp, but also surprised that camp was fairly laid back, "as long as you do your work" ... According to Joe McDonald of the Providence Journal, Francona doesn't rule out the chances of Chris Carter earning the bench spot left open by Mark Kotsay's injury, but only if Carter is able to help the team defensively ... Earlier this morning, we reported that fifteen Red sox players were named to final WBC rosters, including eleven minor leaguers ... WBC games start on March 5. The first round of the WBC kicks off on March 5, with the sixteen teams split into four pools and games in Tokyo, Mexico City, Toronto, and San Juan. The top two teams from each pool will qualify for the second round, which will be held from March 14-19 in San Diego and Miami. The semi-finals will then be held on March 21 and 22 in Los Angeles, followed by the finals on March 22, also in Los Angeles. Check out the WBC official site for a full schedule. Nearly every level of the Red Sox farm system boasts one or two intriguing shortstop prospects. Four of the top 20 Red Sox prospects, as ranked by SoxProspects.com, are shortstops, and two or three other talents in the lower minors could jump into that group with solid seasons. By design, the top infielders in the system stay at short as long as possible, or until forced from the position by a more highly-touted prospect. In the Bigs: Shortstop is the only position in the lineup that is uncertain as Spring Training games approach. Julio Lugo has been bad at the plate and in the field for two seasons, and ended last year on the DL. Jed Lowrie was impressive when he reached the Majors last season, playing both shortstop and third base, but a wrist injury hurt his performance in the last month and a half. While the two will technically battle for the starting job at short, both should see their fair share of at-bats as Mike Lowell recovers from hip surgery. Cream of the Crop: Yamaico Navarro emerged as the system’s top full-season shortstop prospect last season, being named a SAL All-Star (he was also a NYPL and DSL All-Star the previous two seasons) and hitting .348/.393/.508 after a promotion to Lancaster. He has shown the versatility to play both second and third base in the past, and may see time at all three positions depending on where the other shortstops are assigned. Navarro will almost certainly start the season as Salem’s everyday shortstop, and should earn a midseason bump up to Portland … Argenis Diaz, the best defensive infielder in the system, will begin the year as Portland’s shortstop. Despite his defensive wizardry, he may spend most of the season in Double-A working on hitting, as his bat will determine if his future is as a starter or utility backup. A September call-up this year is not out of the question, given that he could field his position at the Major League level right now … Oscar Tejeda was unable to cash in on his promise in 2008 for myriad reasons. He started the season in Extended Spring Training due to a staph infection, then redeveloped the infection after being assigned to Greenville. It was not until August, when Tejeda hit .287/.328/.417, that Tejeda was able to get going, but that he at least held his own as an 18-year-old in the SAL is a nice accomplishment in itself. The Sox could give Tejeda another shot at Greenville to start the year, but the infield there is already crowded enough, which could force him to Salem, where he may have to move around the infield again in deference to Navarro … 2008 first-rounder Casey Kelly has great promise at short, but of course may not even play there after this season. Kelly prefers shortstop, but the Red Sox seem to prefer him as a pitcher. Still, he is a top talent at both positions, and although he had a forgettable stint at the plate in the GCL (.173/.229/.255), he still flashed great defensive talent and performed much better in a small sample size in Lowell (.344/.344/.563). The team’s plans for him this year are well documented, as he will pitch 100 innings in Greenville, then move to shortstop. However, it remains to be seen if this two-position experiment will continue past 2009. AAA: As mentioned in our last installment, Ivan Ochoa, Gil Velazquez, Angel Chavez, and Nick Green are all capable of playing shortstop, and all are headed for Pawtucket. Chavez will likely start at third and Green at second, leaving Ochoa and Velazquez to battle for short. After getting an extensive call up to the Giants last season, in which he played in 47 games, Ochoa would seem to have the edge, but the Sox showed faith in Velazquez when they re-signed him as a minor league free agent this offseason … A fan favorite in the organization since being drafted in 2003, Iggy Suarez finds himself at a crossroads. He has played parts of three seasons in Portland, but still has not done enough to earn a promotion to Pawtucket. Suarez will have to prove that his bat is good enough to handle Triple-A to beat out one of the four previously-mentioned infielders for a roster spot, as it is tough to see him spending another season in Portland. AA: Also covered previously, Khoury would grab the starting job at second in Portland if Chih-Hsien Chiang is moved to the outfield full-time or stays behind in Extended Spring Training … Reza could start in either Portland or Salem backing up second, third, and short. A: A 2008 second-round pick, Derrik Gibson was the opposite of Kelly at the plate, hitting well in the GCL (.309/.411/.394), but struggling in Lowell (.086/.233/.086). Although he has the defensive chops to play short, he shifted between there, second, and third in deference to Kelly. With Kelly beginning the year on the mound, Gibson would seem destined to start at short in Greenville. However, if Tejeda starts there instead of in Salem, either Gibson or Ryan Dent could start in Extended Spring Training rather than sit the bench … Jonathan Hee was Dent’s backup at shortstop until Kelly and Gibson were promoted to Lowell. He will likely be an infield reserve in Greenville. SS-A: Like Gibson, Joantoni Garcia is primarily a shortstop but was forced to move around the infield in the GCL last year. Still just 18, he will likely serve as Lowell’s starting shortstop once the New York-Penn League begins. Rookie: Although Rafael Espinoza received some pre-DSL hype at shortstop, it was Jose Garcia that started there after he signed in May 2008. Garcia did not have a great campaign at the plate, but reports on his defense are good, and he should come stateside this season and play in the GCL. Although he should be the primary shortstop, Espinoza may play more at short than he did in the DSL … A rare undrafted free agent out of high school, Roberto Ramos flashed enough potential in limited, sporadic playing time in the GCL to become an interesting player to watch. Already 20 years old, he will not have much time to catch the eye of Sox brass; he is a wild card whose 2009 season could fall anywhere between starting in center in the GCL to not making it out of Extended Spring Training. He saw time at both middle infield positions and all three outfield spots in just 18 games last year, but primarily played shortstop and center field. Where he gets his time will depend as much on the 2009 draft class as it does on where he fits best, but center field is open in Ft. Myers right now. DSL: Heiker Menses saw most of his time at second and third last year, but did play some shortstop and is the best bet of the players currently under contract to be the DSL starter there. That could change depending on who else signs between now and late May. So Long, Farewell: Alex Cora signed with the Mets this offseason after 3 1/2 years as Boston’s backup middle infielder … Christian Lara was traded to the Dodgers for RP Eric Hull early in the 2008 season. He put up a .254/.322/.345 line for Inland Empire of the California League, splitting his time between second, third, and short after exclusively playing shortstop in the Red Sox system … Josh Wilson was acquired from the Pirates on August 2, 2008 for cash, playing 27 games in Pawtucket. He signed a minor-league deal with the Cardinals this offseason. Lots of minor league notes over the past couple days ... The Providence Journal brings us a report on Daniel Bard, who is trying to channel the adrenaline rush he gets from facing big league hitters for the first time into increased intensity on the mound ... Bard has impressed Terry Francona with his slider, and also plans to work on developing his change-up in 2009, this according to Rob Bradford of WEEI.com ... Bradford also reports that pitching coach John Farrell has been most impressed with Kris Johnson and Junichi Tazawa so far this spring ... According to Bradford, Farrell has been pleasantly surprised by Tazawa's command and mature demeanor, and Johnson's advanced arsenal and the movement on his fastball ... Johnson hopes to tighten up his breaking ball and slow down his change-up a bit in 2009 ... The Red Sox have let Clay Buchholz return to the natural over-the-top arm slot that he used in 2007 .. So far Buchholz has impressed with increased command, control, and confidence ... Adam Mills has been added as a non-roster invitee to big league camp ... Mills, Johnson, and Enrique Gonzalez are apparently all vying for the final spot in Pawtucket's rotation, but another rotation spot could open up in Pawtucket if Devern Hansack is moved to the PawSox bullpen - where he could more likely contribute to the big league club in 2009 ... Dusty Brown has apparently impressed in batting practice this spring, showing increased home run power ... We should have some decisions on WBC rosters come Wednesday - among players in the Sox organization, look for Dustin Pedroia and Kevin Youkilis to represent the United States, Jason Bay to play for team Canada, Daisuke Matsuzaka to take the hill for Japan, Enrique Gonzalez to pitch for Venezuela, Mitch Dening to play for Australia, and Che-Hsuan Lin and Chih-Hsien Chiang to play for Taiwan ... The Boston Herald reports that bullpen coach Gary Tuck continues his annual "dropped-ball" competition among catchers in camp, where the catchers keep track of how many pitches they've dropped (not counting knuckleballs from Tim Wakefield and Charlie Zink) ... Carlos Maldanado is in the lead without any drops, and Mark Wagner and Jason Varitek come in next with only one drop each ... George Kottaras won the competition in 2008 ... Jon Lester mistakenly drilled Brad Wilkerson in the back on Sunday, leaving a noticeable bruise ... Rule 5 pick Miguel Gonzalez felt some discomfort in his elbow on Saturday, and was held back from finishing a side session as a precautionary measure ... Gonzalez sat out the rest of the weekend and took some anti-inflamatories, but is now scheduled to have an x-ray to determine if there is any damage in his elbow ... He will miss about five days ... The big league spring training game schedule kicks off on Wednesday, and Boston's initial rotation will be Josh Beckett, Wakefield, and Lester, followed by Michael Bowden, Johnson, and Buchholz ... ... Bowden will take the mound on Friday night against Tampa Bay, Johnson will pitch against Northeastern on Saturday afternoon, and Buchholz will toe the rubber against the Reds on Saturday night ... Minor league mini-camp opens today, with certain players who were slected to participate ... All minor leaguer pitchers and catchers are required to report on March 6 ... Positon players are required to report on March 13 ... Full squad workouts begin on March 15 ... The minor league game schedule begins against the Minnesota farm teams on March 18. The seventh installment of the Prospects Previews series focuses on a promising pitcher looking to come back from an injury, and an outfielder looking to impress at the next level. Strengths: Hagadone’s blistering fastball and hard, tight slider are the two best pitches in his arsenal. Sitting 94-95 MPH, his fastball explodes on hitters with excellent late life, and during his short stint in Greenville in 2008, the Red Sox had Hagadone topping out at 97 MPH with the pitch. Along with his above-average fastball velocity, Hagadone has excellent command of the pitch, able to move it from corner to corner. After signing in 2007, he dominated the NYPL with his fastball and, with the exception of his first professional start, was virtually untouched by hitters. An aggressive pitcher, Hagadone uses his fastball to get ahead in the count and to finish hitters off. His slider comes in 82-84 MPH with hard bite and quickly drops out of the strike zone into the dirt. Hagadone has the ability to throw it for a strike, but this pitch is mostly buried on hitters with very little chance of contact when it is down in the zone. A hard worker, the 6’5’’ and 230 pound pitcher could still put a little more muscle on his frame. Development Needs: Hagadone suffered a torn UCL tendon and underwent Tommy John Surgery in June of 2008. He suffered the injury in only his third start with the Greenville Drive, but had to wait until a leg infection cleared up to have the procedure. At 23 years old, Hagadone is a little bit behind the curve in terms of age as a result of the injury and lost some development time. His change-up is the most raw of his pitches, having been introduced to his arsenal after signing with the Red Sox. The pitch had been making some good strides, but was still relatively inconsistent prior to his injury and didn’t have great deception. His arm action would slow when delivering the pitch, but that aspect had been making improvements. A former closer in college, the Red Sox were converting Hagadone to a starting pitcher, but his role now remains to be seen after suffering his injury. Scouts were undecided on his projection as a pitcher, with many believing that he’d end up in the bullpen in the future anyway. 2009 Outlook: Hagadone will continue rehabbing his arm down in Florida after the full-season teams break camp, with mid-May targeted as his return. He’s currently about 85% with his arm and hasn’t begun reaching back on his pitches just yet. Once ready to pitch in game action, Hagadone will either report to Greenville or Salem. The Red Sox may start him off slow to get his feet wet before placing him in High-A. Expect his pitches to be a bit rusty and command to be off in the beginning while he gets the feel for his pitches back. It may not be until 2010 when a clear picture of his stuff will come back into focus, but Hagadone has been ahead of schedule in his return and is known as a very hard worker. His slider may not have as much bite as he gets the feel back for snapping it, but the pitch should return for him. Another thing to watch for is how he trusts his change-up. This was the pitch he injured his arm throwing, and he will have to gain trust in the pitch once again. The development of this pitch is key to whether Hagadone stays in the rotation or becomes a late-inning reliever. Strengths: Mailman has a textbook swing that effortlessly flows through the hitting zone. Smooth and fluid, he generates excellent batspeed with ease. Mailman can drop the head of the bat on inside pitches and go the other way with ones on the outside corner of the plate. A very patient hitter, he works the count looking for his pitch to hit, and he has a pretty good understanding of the strike zone for a hitter his age. An excellent athlete, Mailman can play all three outfield positions, but most likely projects as a corner outfielder down the line. Mailman’s arm is strong enough to play well in right, and he can cover some ground with his above-average speed. On the bases, he’s a threat to swipe a bag and should be able to pick his spots to run on pitchers. The Red Sox felt Mailman was advanced enough to start him with Greenville last season after being drafted in 2007. After initially struggling in Greenville, Mailman made strides as he got more and more comfortable in the batter’s box and he finished the season strong. Development Needs: Mailman could pack on some muscle to his frame and will need to increase his power if he is ultimately going to be a corner outfielder. Standing 6’2’’ and 180 pounds, he’s on the lean side, but has a frame that could add some size as he works on his strength training. A patient hitter at the plate, Mailman could stand to be a little more aggressive and attack the pitches he can drive by hitting through the ball more. 32% of his strikeouts last season came on called third strikes, which led Red Sox full-season players in 2008. Some work in this area could lead to an increase in the balls that Mailman drives into the field of play. A lot of his work at the plate will center on his continued learning of the strike zone, and on driving the ball more to all fields. Mailman struggles against left-handed pitching, only hitting .154 against southpaws last season, which will be an area in which he needs to improve. Although he is still a raw hitter, Mailman has shown why the Red Sox were high on him after selecting him in the 7th round in 2007. 2009 Outlook: Mailman should be set to start the season in the Salem Red Sox’ outfield. Looking to build off the success he had to finish 2008, Mailman should continue to be more confident in the box. One of his main development areas will be an improvement in his pitch recognition and a refined approach to what pitches he is going to be able to drive. Things may start off slow for him, but expect him to be a more aggressive hitter at this level and one who will use the whole field. He should continue to draw walks, and a good sign of positive development will be a reduction in his strikeouts. Another good sign will be an increase in the number of extra base hits he produces as he develops into more of threat to drive the ball into the gaps. Mailman’s power may be a little ways off, but hard contact into the gaps is a good sign he will be capable of producing lift on the ball once he fills out. In the Bigs: Dustin Pedroia is the reigning AL MVP, and signed a six-year, $40-million extension in the offseason with a club option for a seventh year. Pedroia is actually a good example of why second base is relatively thin in this farm system—a shortstop at Arizona State, the organization groomed him at that position for as long as they could, opting not to switch him to second, his likely position, until he was closer to the majors … When Pedroia needs a day off, either Julio Lugo or Jed Lowrie will slide over to second. Cream of the Crop: The only player in this bunch ranked on the SoxProspects.com Top 40 is Chih-Hsien Chiang, who began an apparent position change by working out as an outfielder in the Fall Instructional League. Turning 21 this weekend, Chiang should spend this season in Portland, and the position he plays may depend more on the rest of the roster than where he is best suited for the future. Given his position change and his likely participation in the World Baseball Classic, there is a good chance that he could start the season in Extended Spring Training to work on his defense … Although he played shortstop in Lowell last season, this should be the year Ryan Dent moves to second, as Derrik Gibson, Oscar Tejeda, and Casey Kelly will get the shortstop innings at Greenville and Salem. While Baseball America still has enough faith in Dent to rank him as the system’s #31 prospect, he will have to improve greatly on his .154/.267/.299 line from 2008 to regain his top-prospect status. AAA: Although Nick Green saw most of his playing time at shortstop last season playing for the Yankees’ Triple-A affiliate in Scranton-Wilkes Barre, it seems likely he will start at second base in Pawtucket. However, with other infielders in Ivan Ochoa, Gil Velazquez, and Angel Chavez also capable of playing second, short, and third, neither he nor anyone in that group has absolute job security. Do not expect any of them to get more than an emergency cup of coffee in the Majors this season … As covered in our last installment, Natale is an on-base machine without a position. He should be part of a crowded Pawtucket infield. AA: A true utility infielder, Ryan Khoury should see a good number of games playing second, third, and short in Portland. He will not unseat Chiang, Jorge Jimenez, or Argenis Diaz, but is capable of starting at any of those positions if there are openings due to injury, promotion, or position change (Chiang). 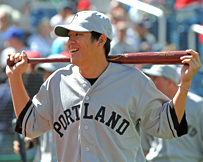 He was used most at shortstop in 2006 and at third the last two seasons, but could begin 2009 as Portland’s starting second baseman if Chaing indeed stays behind in Ft. Myers … Zach Borowiak returns to the organization after one year of retirement, but it is hard to see where he fits in the system. He has already spent two uninspiring seasons in Portland, never producing an OPS above .600. He is a great fielder, but the system is much deeper at the higher levels than it was in 2007. A+: Kris Negron is capable of playing six positions (2B, SS, 3B, LF, CF, RF), but mostly found his niche as a starting second baseman in 2008. He started the season poorly at the plate, but came around some and got red hot after a promotion to Lancaster (.328/.377/.629). With his speed, he would make a great leadoff hitter, but he has to make far more contact than he did in Greenville and prove that his late-season spike was not just attributable to Lancaster’s environment … Aaron Reza is also versatile enough to handle second, short, and third, fielding all three positions very well. After dominating Greenville in 51 at-bats to start the year, he simmered down some in Lancaster. Although he could probably handle Portland, whether he starts there or in Salem will depend on injuries and other roster decisions … Segovia plays the same positions as Reza, but without much of a bat (.259/.286/.333 in Lancaster in 2008 was by far his best line of his career), it is tough to find where he could be assigned with the glut of young, talented infielders coming up behind him. A: Tom Di Benedetto, Zach Gentile, and Jon Hee are all 2008 college draftees who are most comfortable at second base. However, all fit best in backup roles, and will be asked to play other infield positions, and perhaps the outfield in certain situations. Where each winds up this year likely depends on what spots are available. SS-A: Ken Roque should get the bump to Lowell after two years in the GCL, which is fine since he is still just 19. Regardless, he will need to show a lot more at the plate to avoid being overtaken by anyone drafted this June, as there is room for at least one infield draftee on the Spinners’ roster. Rookie: Rafael Espinoza, a relatively-hyped Dominican signee, should make his stateside debut this year. He showed good speed (8 triples in 256 at-bats) and great plate discipline (.160 IsoD), but very little power in the DSL. Although he was called a shortstop when he signed, he played mostly second base last season in deference to Jose Garcia. DSL: Robelys Reyes was signed last May, but missed the DSL season with an injury. He will debut this season and turn 19 in July. He is not helped by being older than Espinoza … Heiker Menses split his time between second and third base last season, part of a rotation in the DSL designed to get more players regular at-bats. He probably will do the same this year, and could even see some more time at shortstop with both Espinoza and Garcia likely headed for Ft. Myers. So Long, Farewell: Joe Thurston had a fantastic year for Pawtucket, and would probably have forced a true Major League call-up in a different system where he was not blocked by the league MVP. He left for greener pastures this offseason, signing with St. Louis … The Sox’ backup middle infielder for three-and-a-half seasons, Alex Cora signed a one-year deal with the Mets … After two decent seasons at the plate in Greenville, Tony Granadillo burst onto everyone’s radar with a .326/.411/.492 season in Lancaster in 2007. However, he had a difficult time recovering from a slow start last year, and was not re-signed as a minor league free agent … Zach Penprase was an independent league signee when a hole opened up in Greenville’s infield following Negron’s promotion. He was also not re-signed. Saturday's news and notes from the minor league complex: Yesterday, several players took part in the annual charity golf tournament for the Children's Hospital of Southwest Florida, including Jon Lester and Charlie Zink ... Ian Browne of redsox.com brings us a nice report on Michael Bowden's expectations for the 2009 season .. Bowden hopes to get some late-season action with the big league club this year ... The minor leaguers continue to roll into town, despite that the mandatory reporting date for most minor leaguers is not until early March ... Jeff Natale and Bryan Pritz both arrived in the last few days ... Alex Speier of WEEI.com brings us some great nuggets from minor league camp: Spieir reports that Lars Anderson will likely see some time in the outfield in 2009, but will likely cover first base and start the season back in Portland ... Zach Daeges continues to tear the cover off the ball in batting practice ... Speier also reports that Hunter Jones is focusing on the command of his slider this spring, and hoping to use it more as an attack pitch in 2009 ... Felix Doubront is back on the mound throwing batting practice, he was held back last week mostly as a precautionary measure ... Some random notes over the last few days: with the Mariners signing 2008 first round pick Josh Fields, the Red Sox 2009 first round draft pick jumps up to #28 overall, ahead of the Yankees (who are locked in at #29 overall for failing to sign 2008 first round pick Gerrit Cole) ... Look for the Sox' second round pick to fall in around #78 overall ... The cutoff for "Super Two" arbitration this past season was 2 years, 140 days ... Manny Delcarmen missed the cut-off by about seven days ... Former top Sox prospect Andy Marte was designated for assignment by Cleveland on Thursday ... Word is that Minnesota and San Francisco are interested ... Some name clarifications of the July 2008 international signings: Juan Vargas corrected to Juan Ugas, Enrique Cuevas is William Enrique Cuevas, and Ali Gonzalez is Aly Gonzalez. The sixth installment of the Prospects Previews series focuses on a young pitcher looking to make the jump to full season baseball, and a catcher trying to make the push to the major league level. Strengths: Strickland has a free and easy delivery that doesn’t put much stress on his arm. His balance and form are very polished, providing him with an excellent base to pitch from and keeping him from overthrowing the ball. Strickland’s fastball sits 89-91 MPH with the ability to top out at 93 MPH. When operating towards the lower range of his velocity, his fastball has some late movement that gives hitters trouble in gauging which angle the ball is coming in at them. After spending his first month as the swingman on the Lowell staff, Strickland earned a spot in the rotation after the promotion of Brock Huntzinger to Greenville and pitched very well over the course of his last ten outings of the season. There was noticeable improvement in the command of Strickland’s fastball and an uptick in his velocity during this stretch. He really pounded the zone and was aggressive with batters. Word from around the Spinners was that Strickland was instructed to work on fastball command in his outings at the beginning of the season, and that the work was paying off as he was more comfortable throwing the pitch, along with being able to keep it down in the zone and not focus too much on throwing the ball by hitters. Strickland has a very projectable frame, standing at 6’5’’ and 200 pounds, which should fill out some as he gets older. Development Needs: Strickland’s slider and change-up are a little more unrefined than his fastball at this point in his career. His slider is more of a slurve, sitting 79-82 MPH, and doesn’t have as much sharp break as it should to be considered a dependable out pitch. However, the pitch has the potential to be a better offering if he can consistently get enough snap on it, causing it to break sharper and get hitters to chase it deeper in the count as it falls off the table. Strickland’s change-up is still in the early stages of development. Sitting 83-85 MPH, there isn’t a lot of separation between it and his fastball. The pitch looks more like a fastball that he is taking something off of rather than a true change-up, but the pitch showed flashes of excellence last season, especially down the stretch when there was some good improvement in Strickland’s overall arsenal. His delivery is smooth, but there isn’t a lot of explosion and drive in it. This is an area where Strickland could make some good strides and produce some added velocity on his fastball. He doesn’t miss a lot of bats right now, but was also instructed to work on throwing down in the zone more. This is another area that could see strong development as he hones in on his release point to make his stuff more consistent. 2009 Outlook: With a crowded starting rotation in Greenville, Stickland could find himself working out of the bullpen, finishing off games to get his starter’s work in. After a nice finish to 2008, look for him to build upon his success as he heads into the 2009 campaign. One of the main areas to watch for in terms of positive development is more consistency in Strickland’s stuff, especially with how he finishes his slider. Strickland will need a pitch to lean on to finish off batters with two strikes and pitch a little more away from contact at this level. Keeping his fastball down in the zone will be a must to have good success in 2009. Look for some more life and command of his fastball in 2009 as he gets better and better at repeating his release point, something he worked on in 2008. Another sign of positive development will be improvement in his change-up. Given the nature of the pitch, with more feel and repetition Strickland could see some marked improvement, which would give him another weapon with which to attack hitters. Strickland is an interesting prospect in 2009, having flown under the radar at Lowell in 2008 given the strength of the other arms on the staff. Greenville looks to be stacked with arms in 2009, but Strickland is an improving pitcher and one that could make another strong gain over the course of the upcoming season. Strengths: With his quickness behind the plate, Wagner is a strong defender overall who is excellent at throwing runners out and blocking balls in the dirt. He has a quick release on his throws which compensates for his arm being slightly above average, but not at elite strength. A hard worker, Wagner puts in the effort to improve his game and demonstrates the leadership ability that a catcher is expected to possess. It was reported that he put a lot of work in his defensive game last season at Portland to focus on the finer points of catching that he was exposed to at the upper levels for the first time in his career. After working with a lot of the pitchers over the course of his three seasons in the Red Sox system, Wagner calls a good game behind the plate and is able to take charge of game situations. In the batter’s box, Wagner hits to the gaps with some decent power. When he is going well, he is driving through the ball and hitting line drives from right-centerfield to down the left-field line. In the lower levels of the minors, he generally made good contact while showing good patience and not striking out too much. Where Wagner doesn’t have one offensive tool that sticks out, they are all average to slightly above average. The Red Sox added Wagner to the 40-man roster in November of 2008. Development Needs: Wagner had a tough year overall in Portland last season and faded down the stretch. Over the course of his career, he has seemed to wear down as the season has gone along. Being able to sustain the wear and tear of the catching position over the course of the season is something that he is going to have to work on and demonstrate if he is going to project as a major league starter. A line drive hitter in the past, Wagner hit a lot of fly balls and struck out more in Portland last season. He looked over-matched with pitches up in the zone, which he had trouble handling and laying off of. A streaky hitter, he can go into prolonged slumps at the plate where his swing mechanics get out of whack. Wagner will need to work on shortening his swing path to the ball and focus on hitting line drives into the gaps rather than trying to jerk fly balls, which he demonstrated in the lower minors when he had some good success at the plate. Behind the plate, Wagner struggled with some of the finer points of catching, like framing pitches during the early part of last season, but made improvements in that area to become a stronger catcher. With no real dominant offensive tool, it’s not known if Wagner will hit enough at the major league level, but a strong season in AA would answer some of the questions. 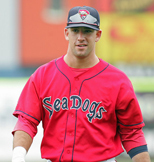 2009 Outlook: Wagner will once again start the season with the Portland Sea Dogs to get regular catching work in and sharpen his skills at the plate. 2009 will be a big season for him to show that last season was a period of adjustment. Expect Wagner to have a better understanding of the pitching in AA and a better idea of which pitches he can handle, while not chasing the pitches he cannot. A good sign of positive development offensively for him is a decrease in the amount of fly balls he hits and a return to driving the ball into the gaps. A shorter, more fluid swing is something to watch for to begin the season. Behind the plate, Wagner should to be stronger with his receiving skills and improve on his game management. A good sign of positive development in this area will be to see some more borderline calls going the pitchers’ way as Wagner is firmer in the way he receives and frames the ball, along with less movement of his glove on pitches in the strike zone. The Red Sox added Wagner to the 40-man roster so his option clock is now ticking. Some strong improvements for Wagner in his targeted areas should push him to Pawtucket to finish off the season, and move him towards the finishing touches of his minor league career. News and notes from the Sox Minor League Complex: Felix Doubront missed a few days of practice last week with a sore back - no word on whether the injury continues to linger ... A slimmed-down Chris Carter is back taking grounders at first base after strictly playing left field and designated hitter in 2008 ... He's still having a few issues with the glove at first, but we've heard several raves about Carter's conditioning and work ethic over the off-season and this Spring ... Josh Reddick appears to have bulked up some over the off-season, and he's been driving the ball well to all fields in batting practice ... To no one's surprise, Lars Anderson still loves to hit to the opposite field - can't wait to see him lining balls off the Green Monster on a regular basis ... Zach Daeges' frame is looking solid, and he continues to smoke liner shots in batting practice, but without a lot of home run loft ... Michael Bowden has hinted to Nick Cafardo that the Sox might be working on adding a new pitch into Bowden's arsenal ... Paul McAnulty, signed to a minor league deal in November, was originally signed by Red Sox amateur scouting director Jason McLeod in June 2002, who at the time was a scout with the Padres ... According to Alex Speier of WEEI.com, McAnulty was McLeod's first-ever signing ... The Brad Wilkerson signing became official earlier this week, and he's working out with the major league club hoping to fill the void left by Mark Kotsay, who reportedly hopes to return from his back injury in early May ... Jed Lowrie, back to full form from his wrist injury, indicates that the injury hampered his ability to turn on the ball, direct his swing, or hit with any sort of power in the final months of the 2008 season ... Lowrie opted to take some time off over the winter to let the injury heal, rather than surgery, which would have caused him to miss spring training ... According to SoxProspects community reports, Jacoby Ellsbury looks bigger muscularly across the back and shoulders ... David Ortiz looks to have lost about 10-15 pounds ... According to other community reports, Justin Masterson, Jonathan Papelbon, Justin Masterson, Hideki Okajima, Manny Delcarmen, Wes Littleton, and Hunter Jones took lots of time out of their schedules to sign autographs for several young fans. The fifth installment of the Prospect Previews series features a young right-handed starting pitcher looking to take the next step in full-season baseball, and a 2008 draft pick set to take on more of a workload behind the plate. Strengths: Huntzinger has a very free and easy over-the-top delivery, and the ball suddenly jumps out of his uniform at hitters. The Red Sox worked extensively with him to re-work his delivery in Extended Spring Training in 2008, and the results were successful for him at Lowell. Huntzinger’s fastball jumps on hitters despite sitting only 89-91 MPH with the ability to hit 93 MPH so far as a professional. NYPL Batters were consistently behind his fastball, either swinging through it or fouling the pitch back. He demonstrated good command of the pitch at Lowell, placing it on the black and keeping it out of the middle of the plate to limit damage against him. He was also able to successfully pound the lower part of the zone with his fastball and set batters up for his slider. Huntzinger’s slider is a strong pitch for him when it is down in the zone and one that hitters will chase when behind in the count. The tight, late break on the pitch allows it to quickly dart out of the hitters’ line of sight after they have committed to the swing, thinking it is a strike. A hard worker, Huntzinger has a passion for the game of baseball and made the most of his time back in Florida before breaking camp for the start of short-season play. Development Needs: After re-working his delivery in 2008, Huntzinger experienced a drop in his fastball velocity. Clocked by the Red Sox at 95 MPH in High School, Huntzinger only touched 93 MPH a couple of times in his outings and worked more in the 90 MPH range throughout his starts. Despite his deceptive delivery, he can be hit up much easier up in the zone without the extra life on his fastball. Red Sox officials feel confident that he’ll find the extra velocity in the future, but the lack of life on his fastball gave him a hard time after his promotion to Greenville; working behind in the count and leaving the ball up in the zone far too often, Huntzinger was touched for twelve home runs in only 26 2/3 innings. This highlights the need for him to keep the ball down while he becomes more comfortable with his new arm slot and delivery. His slider becomes less of a factor when it is up in the zone as well, as it flattens out and becomes more of a slurve. Huntzinger will need to be more consistent with this pitch and improve how he finishes through it. Lacking a change-up upon entering the system, this pitch has improved steadily for him to where he can work it into counts, but it is still a little ways from being an effective fixture in his arsenal. Huntzinger currently lacks a consistent out pitch and has to pitch to contact, but his repertoire is improving at a good rate. 2009 Outlook: Huntzinger will start with the Greenville Drive in their starting rotation. The big right-handed starter should have a better feel for how he is going to have to attack hitters after last season’s promotion to the SAL. Look for Huntzinger to be successful if he is able to keep all of pitches down in the zone. He’ll have to change the eye level of hitters, but he won’t be able to live up in the zone at this level while he is finding the range on his fastball. One of the main things to watch for is the development Huntzinger sees on his change-up. This pitch made some good strides in 2008, after he only started to throw it after signing with the Red Sox. An effective change-up will give him three pitches in his arsenal and allow him to mix it up to hitters multiple times through the lineup. The development of this pitch will be a good indicator as to whether he’ll end up in the rotation or bullpen down the line in his career. Another key to watch for is the improvement of his fastball velocity and if it ends up back in the mid-90’s as it was before he reworked his delivery. An uptick in velocity would make his fastball that much more effective given how deceptive his release point is. Strengths: A big and strong player, Lavarnway stands 6’4’’ and 225 pounds, with excellent present power and power potential. The ball comes off his bat as majestic fly balls when he steps into a pitch. With outstanding plate discipline entering the system, he makes very good contact and has a pretty good understanding of what pitches he can and cannot handle. Lavarnway crushes mistake pitches, especially out and over the plate where he can get his arms extended to utilize all of the power in his lower body. He shows good plate coverage, able to get the fat part of the bat on balls towards the outer third of the plate. Behind the plate, he has soft hands as a receiver and an improving arm. Lavarnway also moves well for a bigger player. Converted to a catcher in 2007 at Yale, Lavarnway hasn’t taken the beating behind the plate that other catchers have taken by his age, and he can make some good strides as he plays the position more and more. Development Needs: Hitting from a closed and crouched stance, Lavarnway is sometimes jammed on pitches up and in where he can’t get his arms extended. The strength of his power lies in pitches out and over the plate at the moment, and he’ll need to work on cleaning inside pitches out with a shorter stroke to prevent pitchers from targeting that spot on him. Once he got behind in the count, he struggled some with breaking pitches down and away, but this should improve as he sees more professional pitching. Behind the plate, Lavarnway has a slow release when he throws the ball and his arm is only average in strength right now. His overall catching skills are unrefined, but he is still learning the ins and outs of the position. After suffering a serious wrist injury, Lavarnway missed significant time in 2008 and was about four months removed from baseball activities when he signed with the Red Sox. His overall game looked rusty as a result of the time off, but with the time to heal and focus on his areas of improvement, Lavarnway could make some strong gains quickly in his overall game. 2009 Outlook: Lavarnway should share the catching duties with Tim Federowicz with the Greenville Drive in 2009. Watch for him to display some good power at this level after feeling his way out and getting into a groove at the plate. To be a consistent threat at the plate, one of the main areas of improvement to watch for with Lavarnway is how well he is going to attack pitches on the inner third. Improvement here will round his offensive game into form, as he already attacks pitches well in the middle of the plate. Lavarnway should be a patient hitter and work some walks as he becomes more and more comfortable with professional pitching. He’ll be deliberate in his at-bats and look to pick pitches out he can drive when ahead in the count. Another area to watch for is how Lavarnway looks behind the plate. He didn’t catch all that much after signing with the Red Sox, but he should be fully healed and ready to assume a workload this season. An improved release on the ball and a better handling of balls in the dirt would be good signs of improvement. A relative unknown at the moment, 2009 could be the year for Lavarnway where he starts to establish himself as an offensive catcher in the Red Sox organization. Baseball America's Jim Callis recently took the time to share his thoughts on the Red Sox farm system with SoxProspects.com's Jonathan Singer. Callis is the Executive Editor at Baseball America, who also was a contributor towards the 2009 Prospect Handbook and ESPN's 2008 draft coverage. JS: Coming into the 2009 season, who do see as the biggest sleepers and who do you expect to disappoint? Why? JC: Will Middlebrooks might be the biggest sleeper. Red Sox fans know who he is, obviously, as he was a high-profile draftee, but he really made some nice adjustments in the second half of the NY-Penn season and I think he could have a very solid year while also playing a nice third base. The college pitchers Boston drafted early last year (Bryan Price, Kyle Weiland, Stephen Fife) got overshadowed by the younger, high-ceiling talent in the system, but I bet one or two of them moves quickly in 2009. Disappointments? The biggest combination how high I ranked a guy on our Top 30 and my lack of love for him is probably Daniel Bard at No. 4. I'm still not sold on anything but the fastball, and I think anyone who expects him to be more than a seventh-inning guy could be disappointed. JS: At what level do you expect Bryan Price, Stephen Fife, and Kyle Weiland to start the season? Out of the three, who do you feel has the best long-term chance of sticking as a starting pitcher? JC: I could see Weiland starting the year in high Class A, with Price and Fife in low Class A with a chance for a midseason promotion. The Red Sox are intrigued by all three as starters, though Price and Weiland pitched more as relievers in college. Weiland has the best long-term shot of being as starter, because he has the best three-pitch mix and command. However, he didn't have a lot of success in that role at Notre Dame, and Boston may be tempted to push him quickly as a reliever. JS: Oscar Tejeda seemed to hold his own as an 18 year old in A-ball last season. What are your thoughts on him? Do you think his tools will start to show themselves in his performance in the near future? JC: Tejeda's year was very solid considering all the physical problems he dealt with (heart surgery, staph infections). He's still very young for his level -- he turned 19 in late December -- and still is a long ways from his physical and developmental peak. The Red Sox know what they have in him, and that he'll need plenty of time to develop. I wouldn't expect a big statistical year from him in 2009, and he may open the season back in low Class A.
JS: Which catchers in the system have a shot at being starters at the major league level? JC: The only one right now that has much of a chance is Luis Exposito, and I'd like to see him repeat his 2008 performance before I get too excited. He also has work to do defensively. Mark Wagner, Dusty Brown, George Kottaras, Tim Federowicz and whoever else you want to mention, they all look like backups to me, especially on a perennial contender like the Red Sox. JS: Do you think either Argenis Diaz or Yamaico Navarro could nose out Jed Lowrie as the "shortstop of the future"? Do you see all three as potential major league starters? Who has the highest ceiling? JC: They could, sure, though I still like Lowrie the best of the three. Navarro had one of the more surprising years in the system last year, though some of that may have been fueled by Lancaster. He's not a switch-hitter, but he's quite similar to Lowrie in that he's an offensive-minded shortstop with solid defense and the ability to play multiple positions. Diaz is easily the best defender of the three, but his bat lags behind them. He has hit for average the last two years, but with not much power or walks. Lowrie has the highest ceiling. I'd take him over Navarro because he's proven himself at much higher levels and is a switch-hitter. JS: What are your thoughts on Kris Johnson, who struggled for two months in Portland and then seemingly found his stride (83.1 IP, 82 H, 71/33 K/BB, 3 HRA)? Is his future in the bullpen or as a back-of-the-rotation starter in the majors? JC: With the Red Sox, more realistically as a middle reliever, because they have better starting candidates. But for a lesser team, I could see him in the rotation, and he could thrust himself into Boston's mix if the curveball he had before Tommy John surgery comes back. His fastball and changeup are slightly above-average, he keeps the ball down, and he's left-handed, so there's some talent to work with there. JS: In your opinion, what is Richie Lentz's (112 Ks in 77.1 IP in 2008, .195 BAA) ceiling? How would you compare his ceiling to that of Daniel Bard (107 Ks in 77.2 IP in 2008, .158 BAA)? JC: Great year for Lentz, but as with Exposito, I want to see him do it again before I get really excited. He still needs to throw a lot more strikes, work inside to left-handers and show a tighter and more consistent slider. Bard has more velocity and more sink, as well as a better frame and medical history, so he's definitely the better prospect. They have similar ceilings, but Bard's is a little higher and he has a better chance of reaching his. JS: What are your thoughts on Brock Huntzinger, who dominated in Lowell (5-0, 0.64 era) but struggled in Greenville (2-3, 7.09 ERA)? What is his ceiling? JC: Huntzinger's home run numbers at Greenville (12 in 27 innings) were stunning, which was a result of losing his command at the end of the season. But I like him. He's just 20 and he's got a strong frame in the Michael Bowden mold. He has a good fastball, but like most young pitchers, is still working on refining his secondary pitches. If it all comes together, he could be a No. 3 starter, but he's a long way from that right now. JS: What is Junichi Tazawa's timeline? Do you think having the major league deal will put pressure on him to develop faster than might be ideal? JC: I don't think the major league contract will add a lot of pressure because it's not like the Red Sox are anxiously awaiting him. They also have seen what has happened when they rushed some relievers in recent years, such as Cla Meredith and Craig Hansen. I think they'll let Tazawa develop at his own pace. That said, he could move very quickly based on talent alone. I've talked to other teams who think he could make for a solid No. 3 starter, but it could be easier for him to break into Boston's bullpen. He has the stuff to start, and his clean delivery and strong body make up for his lack of size. JS: In the Prospect Handbook you noted that Will Middlebrooks posted a .305/.352/.475 line in the final seven weeks of the season after a disappointing start in Lowell. Was this a turning point for him that can springboard him to greater success in 2009, or do you see him coming back down from that a bit? JC: I do think it was a springboard for future success. He got off to a horrible start (.187/.227/.231 in the first month), and the Red Sox got on him to change his approach and snap out of it. He was able to do so--unlike Ryan Dent--and started working counts and looking for specific pitches in specific zones when he got ahead of hitters. I don't know if it's realistic to expect him to hit .305/.352/.475 this year in low Class A, but I could see .280/.340/.450 being realistic. JS: There was a lot of hype for Ryan Kalish before he broke his hamate bone. Reports indicated that he was not driving the ball last year; was that a function of his wrist and something you think he will improve in the future? Will we see Ryan break out this season? JC: It sounds like that was related to the wrist, as he didn't seem to turn his swing loose like he had in the past. That shouldn't be a long-term problem. As he gets healthier and more confident in the wrist, he should be able to get his swing back and drive more balls. I don't think he'll ever be a big power hitter, as he's more of a guy who should hit for average with 15-20 homers per year. I think he'll be better this year and get back on track. JS: Anthony Rizzo missed all last season except for 83 at-bats due to Hodgkin's Lymphoma and lost significant development time. Do you think he can get back on track quickly or will this set him back significantly? What kind of player can he become? JC: It's hard to say how quickly he'll get back on track, though Jon Lester exceeded expectations. It comes down to how much strength and timing Rizzo lost. I think getting him on the field and cancer-free this season will be a victory, and his performance is more of a bonus, if that makes sense. The Red Sox saw some flashes of Lars Anderson in Rizzo, as he has a good approach and power to the opposite field. They won't need to rush him with Anderson so far ahead of him, but he can be pretty good. The fourth installment of the Prospect Previews series takes an in depth look at the Red Sox 3rd Round Draft Pick from the 2008 Draft, and an exciting young shortstop looking for a breakout season in 2009. Strengths: Fife’s live 4-seam fastball and curveball are the two best pitches in his arsenal at this point in time. His fastball works 90-93 MPH topping out at 95 MPH with hard down-and-in run at right-handed batters. Batters routinely broke their bats on this pitch or pounded it into the ground at Lowell in 2008. When he turns the pitch over, he gets some nice sink on it as well. Fife is able to avoid solid contact with his fastball because of its movement, and he doesn’t make too many mistakes with the pitch up in the zone given his good command. His curveball is extremely sharp and has excellent snap, appearing in the strike zone and then quickly fading into the dirt. The pitch can come as hard as 80 MPH, but usually sits 76-78 MPH with hard bite. Batters don’t have much of a comfort level against Fife as the ball appears out of his uniform via his jerky delivery. A reliever until 2008 at Utah, Fife made a successful transition to the starting rotation his Junior Year, going deep into games for the Utes. Developmental Needs: Fife’s slider has excellent potential, but is slightly behind his fastball and curveball. Sitting 80-83 MPH, the pitch can be slurvy and inconsistent at times, grabbing a bit too much of the plate. He got hit almost exclusively with his slider in one appearance for the Spinners last season. When Fife does throw his slider effectively, it should be effective against both left-handed and right-handed batters, as the pitch sweeps out of the strike zone. Fife also has a change-up in his repertoire, but this is the least advanced of his offerings and a pitch that he didn’t really throw all that much after signing with the Red Sox. He will need to work on his change-up to gain trust and feel for the pitch to give him another weapon in his arsenal. Fife’s delivery hides the ball well from batters, but it is somewhat violent, snapping the ball as it comes out of his hand with some jerky motions. There could be a need to tweak the delivery a little bit to take some stress off of his shoulder, but the Red Sox didn’t have him change anything as of last season. 2009 Outlook: The Red Sox were protective of Fife last season, having him work structure innings out of the bullpen, usually going 2-3 innings as he threw a lot of innings prior to being drafted. This season, Fife looks set to work out of the starting rotation for the Salem Red Sox. Expect Fife to mix in all of his pitches in his outings, get a lot of groundballs, and break some bats with his fastball. One of the main things to watch with Fife’s development is how quickly his change-up will come up to speed with his other pitches. An established change-up would give Fife a fourth pitch in his arsenal and really make him tough for batters to establish a rhythm against. When Fife picks up a strikeout, it will most likely be on his hammer curve. Another area to keep a watch on is how well he finishes off batters with his slider; Fife could potentially have two out pitches to lean on deeper into counts with some more refinement on the pitch. 2009 will give us a good look at Fife, and he could prove to be a player that could rise quickly through the Red Sox system. Strengths: With quick wrists, Tejeda possess excellent bat speed and has a smooth swing through the hitting zone. The bat head whips through the zone to the point of contact and he makes hard contact, producing line drives. Tejeda has no problem catching up to fastballs despite being age-advanced and one of the younger players in each league in which he’s played. An exceptional athlete, Tejeda has above-average speed and an excellent arm in the field. He is very smooth and agile both the plate and in the field. Standing at 6’1’’ and 177 pounds, Tejeda has the potential to fill out his frame as he gets older and increase his power potential. He’s picked up the English language quickly and impressed those around him with his intellect. Being so young and age-advanced, Tejeda has a high ceiling as a baseball player and a lot of professional experience under his belt for a player his age. His skills and talent make him an intriguing player to follow and one who can become an impact player if things come together. Developmental Needs: Currently, there is not much power in Tejeda’s game and it is not really known how it is going to project. On-lookers have noted how he appears physically behind the curve, but he was able to hold his own last season with the Greenville Drive. He struggles with off-speed pitches and will chase them down and away in the dirt, but he has been improving on his pitch recognition to let these pitches go. He’ll make a spectacular play in the field, showing off his strong arm, and then on the next play botch a routine grounder or throw a ball into the stands. The majority of his errors are usually on routine grounders or off balance throws that he may have had time to get his feet set on. Despite his above-average speed, the stolen base totals have not been there as of yet for Tejeda. Overall, Tejeda is still on the raw side and needs a lot of refinement in his game, but has been making strides with his improvements and has the reputation as a player who picks things up quickly. 2009 Outlook: Tejeda looks ready to make the jump to the next level with the Salem Red Sox. He’s had a healthy off-season after battling some injuries during the last one and into Spring Training in 2008. He appears a little more muscular and looks to have added some weight this off-season. 2009 will be an interesting year for Tejeda. Advancing another level, he’ll once again be one of the younger players in his league, and this could mask some of his progress during the season. It will be key to watch how he handles the strike zone and if he has improved on picking out the pitches he can handle while letting the ones he can’t go by. Strong improvement in this area could produce some really nice results for him this season After seeing some time at the hot corner in 2008, Tejeda could once again see some time over there this season with Salem along with his natural position at shortstop. Tejeda should hit the ball hard into the gaps and use the whole field more in 2009. With his body maturing, an increase in his power numbers could follow in 2009, but that part of his game is still far from being a huge factor.